How can miniaturization continue beyond the limits of current silicon-based device technology? A project at IBM aims to have transistors built using carbon nanotubes, ready to take over from silicon transistors in the coming years. The effort remains within IBM's research labs but that effort continues, as the industry ponders how it can keep scaling down silicon transistors much further, and what might succeed silicon. 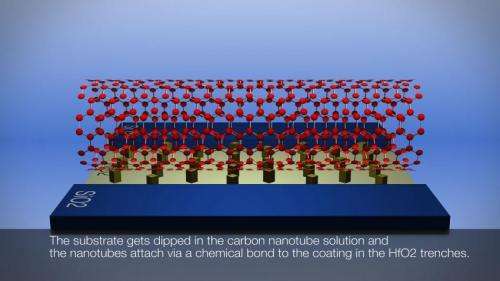 According to IBM, "IBM scientists are now examining the basic properties of carbon nanotubes and the feasibility of using them as the basis for a new class of nanoelectronic devices." Looking toward carbon nanotubes as a successor to silicon can be viewed in the light of silicon constraints. Semiconductor industry experts say that soon after 2020 transistors must have features as small as five nanometers to keep up with the miniaturization of computer chips. A detailed report about the IBM effort in Technology Review explained more about that: "Generations of chip-making technology are known by the size of the smallest structure they can write into a chip. The current best is 14 nanometers, and by 2020, in order to keep up with Moore's Law, the industry will need to be down to five nanometers." Dr. Wilfried Haensch is the Carbon Nanotube project leader; he and his team, said Technology Review, chose the target for commercialization based on the timetable of technical improvements the chip industry has mapped out to keep alive Moore's Law. By 2020, in order to keep up with Moore's Law, the industry will need to be down to five nanometers. This is the point where IBM hopes nanotubes can step in. Technology Review noted that IBM is the first major company to commit to getting the technology ready for commercialization. "Made in IBM Labs: Researchers Demonstrate Initial Steps toward Commercial Fabrication of Carbon Nanotubes as a Successor to Silicon"—that was the title back in 2012 of an IBM discussion regarding its work on a silicon successor. The article said that "Silicon transistors, tiny switches that carry information on a chip, have been made smaller year after year, but they are approaching a point of physical limitation. Their increasingly small dimensions, now reaching the nanoscale, will prohibit any gains in performance due to the nature of silicon and the laws of physics." On the other hand, "Carbon nanotubes represent a new class of semiconductor materials whose electrical properties are more attractive than silicon, particularly for building nanoscale transistor devices that are a few tens of atoms across." 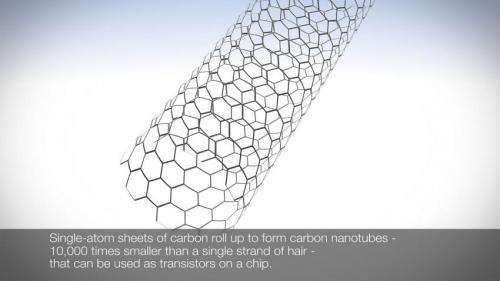 Meanwhile, also in 2012, Haensch, together with research scientist Dr. Hongsik Park, wrote "Carbon nanotubes to keep up with Moore's Law." They said they thought that one of silicon's promising successors in the Moore's Law race is carbon nanotubes. "Increasing the number of cores on a chip would also provide an even higher degree of parallel processing. Our models show that carbon nanotube chips would have about a five to 10 times improvement in performance compared to silicon circuits."